See all Sky Terrace - For Sale. 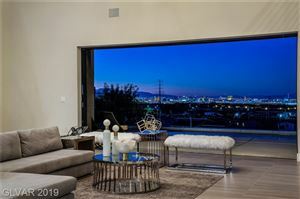 Sky Terrace is a neighborhood of contemporary architectural designed homes in Henderson, Nevada, predominantly built by the well-respected local luxury homebuilder Blue Heron. Residents have a choice of either one of the pre-designed custom homes or a fully custom home. The pre-designed custom homes have five different floor plans ranging from approximately 3,400 to 5,800 square feet. Some features of these modern homes include courtyard-style floor plans, 20-foot ceilings, 8-foot doors and three-bay garages. The homes at Sky Terrace can include luxury amenities and optional features including a sky deck, casita, floating staircase, media room, disappearing glass walls, custom landscape and pool designs. Blue Heron is committed to being environmentally sensitive and ecologically smart in their design and build of Sky Terrace. That commitment affects a number of their decisions, such as site selection and the use of energy-efficient features like passive solar design, environmentally friendly building materials, tankless water heaters, sealed attic spaces, water smart landscape, and Energy Star appliances.